What is your intent to appreciate your experience today? Observe the ways in which it makes a difference to yourself and to others. The labyrinth is a mechanism activated by our intent and appreciation of our own ability to understand what it contributes, and how it contributes to our life in any given moment that we choose to explore and experience it. When its all said and done, its an invitation. In this vast week of blessings, appreciation for the eye opening explorations to see more blessings in more places has magnified the experience of gratitude. 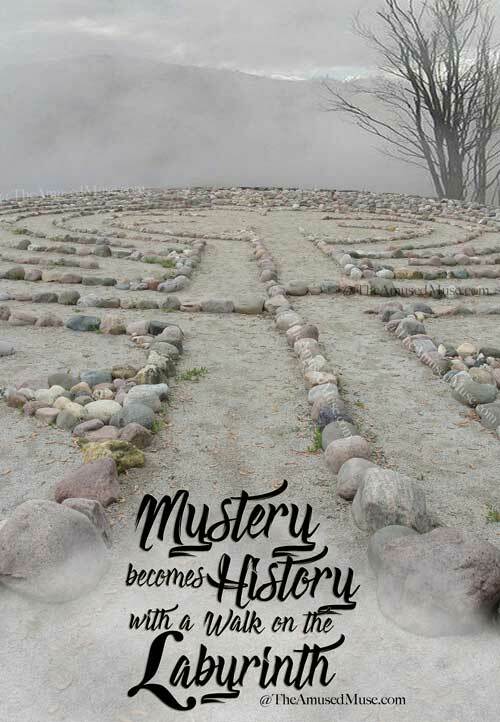 Finding the great and full nature of the labyrinth’s ample design for discoveries, inquiries, investigations and experiments into body, mind and soul provided more comprehensive understanding of a thankful nature. 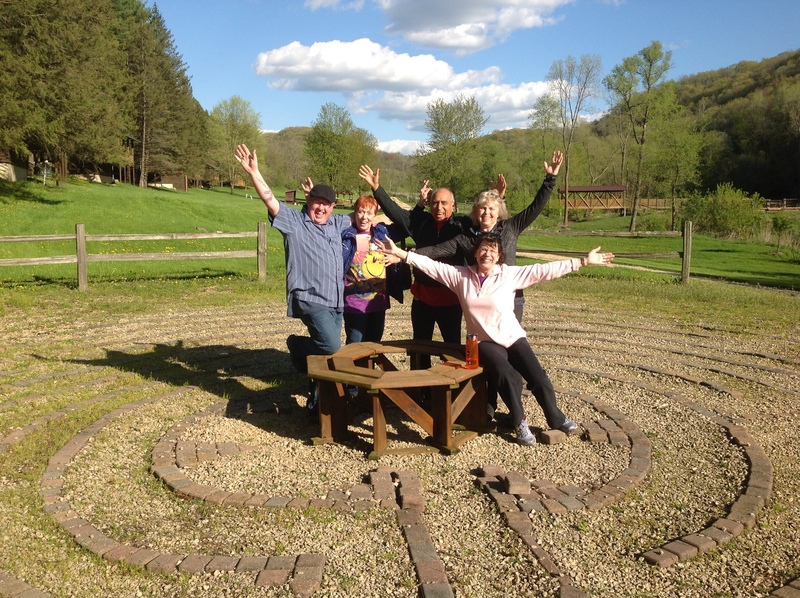 The combination of the labyrinth experience and gratitude has evidenced and generated a positive far reaching experiential education of gratitude in the blessings it has provided. 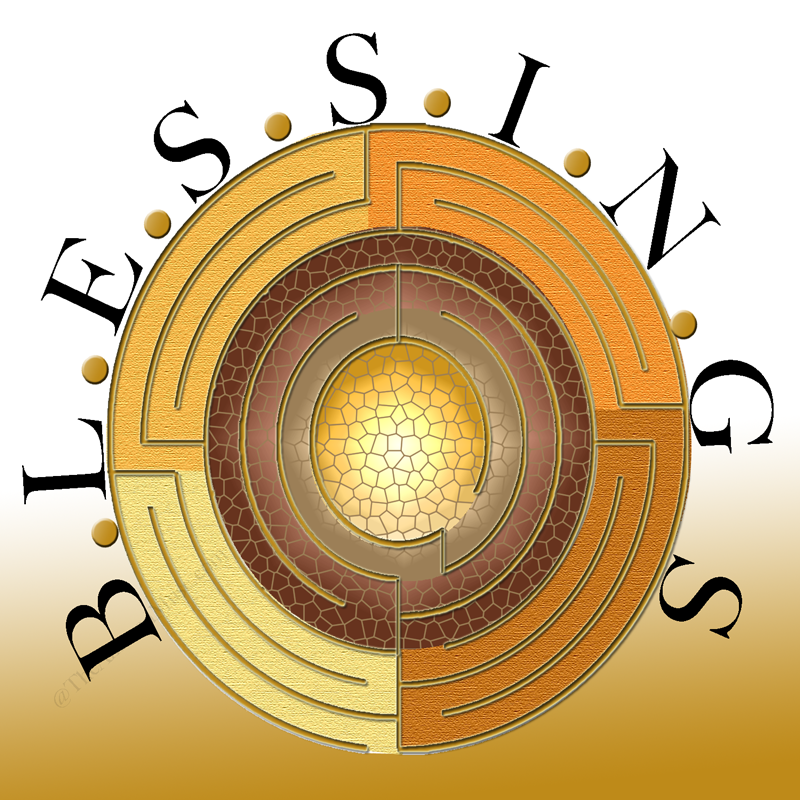 The seven paths of the Blessing Labyrinth have offered copious benefits, education, insights and results that are inexhaustible in the profuse benefits of gratitude blessings. Path One – Beyond what we may know, the exploration that is outside the normal can be walked to realize a normal existence and a more natural inquisitive one. Path Two – Lessons are a continual source of learning, affirming, realizing and recognizing ourselves and our environs for their blessings. Rediscover the path today. 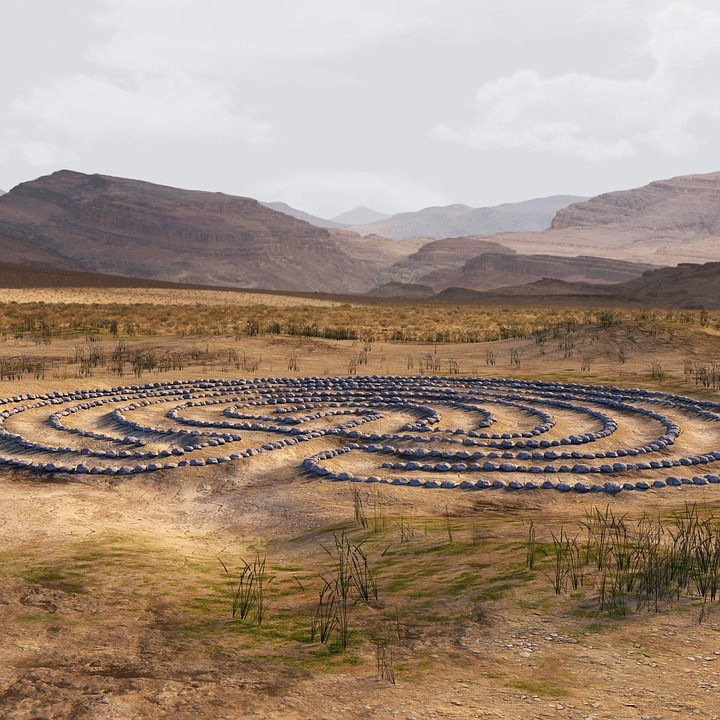 Path Three – Embracing an experience is to fully appreciate the experiential nature of both the blessings of the labyrinth and the labyrinth of blessings provided. Refresh your path today with the week’s memorable day. Path Four – Savoring the experience furthers the understanding and appreciation that multiply the benefits of the blessings received.Review the savory path. Path Five – Sharing becomes the ultimate in contribution from a learned and knowing place that is experientially aware and present to purposeful and usefulness that blessings provide. Reflect on your sharing pathway. Path Six – Actionable Orientations and the combined collective of the suffix of ING offered an exemplary and comprehensive experience path to reconstruct today. Path Seven – Surplus describes the enormity of the results of gratitude in the blessings that have a way of showing us the relative preponderance we may become a part of when in step with giving and receiving the review of blessings. 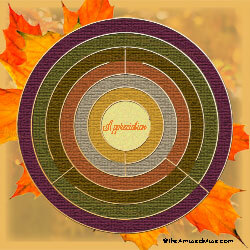 A summary walk of all will infuse a plethora of gratitude. Walk in the fullness of a week of counting blessings to realize what you walk away with. Using the letters of the word of appreciation and dividing them between cause and effect, offered and insightful experience of moving with and through the path of the labyrinth each day this week. Assigning two letters each day offered an element of appreciation to walk into as a beginning of the walk and a word of focus to bring reflection and ending with another aspect of appreciation. The week has offered many gifts and much in gratitude. 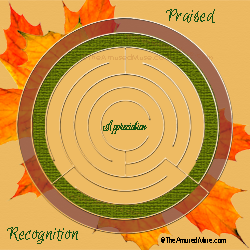 Where the abundance of appreciation can be found within its own framework, we might begin to see a way to apply lessons of the labyrinth as learning for ourselves in a way we can appreciate. The seven paths of the Appreciation Labyrinth have had both inward and outward experiences and a summary path in the center to explore. Walk to review the appreciation. Path One – Acceptance became a stride of focus to provide for the possibilities that followed. Walk on the ways in which you created appreciation for each. 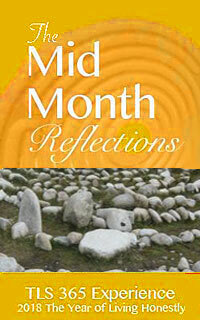 Path Two – Praise in reflective walk gives rise to what we recognize, making us appreciative of the experiences. Walk with the appreciation that was applied this week. Path Three – Esteemed awareness is an earnest appreciation of our greater abilities that make us cherish and be cherished more in appreciation. Walk reflectively. Path Four – Improvement inspires applause. As we are continually changing, the direction of improving makes us more appreciative with cause for applause. Review your week of growing wonder and appreciation. Path Five – Treasured existence, abilities and acknowledgement helps us to realize how invaluable we truly are. Walk with the appreciation that grew this week. Path Six – Obliged and full of gratitude, our experiences become noteworthy and significantly appreciated. Walk with great appreciation for your week’s experiences. Path Seven – Let the center path of this labyrinth be the summarizing experience of bringing the magnitude of your creation and development into an abundance of appreciation of what you grew and put effort in knowing. Walk the seven paths allowing the seventh in the center to be reflective of the walk of appreciation you brought to the week. What we put in, we take away and in the labyrinth, it is as simple as walking in, through to realization and walking out with a little different realization. It isn’t always obvious, though there is always something that occurs, even if it seems like nothing at all happened, that is something. To be heard, seen and acknowledged is a simple appreciation and acknowledgement of our contribution. It is a kindness to recognize the deeds of others for their service or additions. When we do we realize that each plays an integral part and that all efforts are appreciated. The worthy act of praise exalts the value of what it praises and raises the vibration of the praiser. It gives recognition of its quality, merits and characteristics that of high caliber and elevation that bring a sense of the feeling of appreciation. This recognition can also be a catalyst to raise the praise, so the two are well matched in their combined work of acknowledging higher attributes and raising esteemed value. In a world that wants to be heard, seen and witnessed, recognition works at a simple level, and with complexity to elevate the feeling of appreciation. Observe the experience of walking in with praise and out in recognition. We’ve explored the expression and the expansion elements of gratitude, and this week we delve into a week in the power of feeling. It is much more than a tactile approach as it involves the somatic bodily realization, thought process, related emotion, sensory, energetic and soul emanating understanding all wrapped into the experience of gratitude called appreciation. As an element of gratitude, appreciation puts us in touch with what shapes our ability to know in a way that elevates our understanding. As appreciation is longer lettered than our seven day experiences, in six days two letters will be appreciated on the path of what we take into our walk and what we take out of it. Each day of the week of Appreciation is met with two letters, one leads us in and the other leads us out. Explore the words that make up appreciation as the third element of gratitude. This week begins with walking into the labyrinth with the concept of Acceptance of mind, body and soul and walks out of the experience with Possibilities. On this first path of the week, observe the movement between and the experiential understanding of that navigation. • A labyrinth walk is appreciated in steps and stages. • Consider what you have and want to have. • In what lands on your path, acknowledge. • Continue, keep walking and discovering. • Observe what is occurring, what becomes possible. • Realize what is possible to accept. • Realize how much more is possible and accepted. • Focus on what is possible. • Notice how possibility grows. • Observe appreciation quietly growing. Where the unexplainable finds explanation on the labyrinth or a resolve to appreciate the mystery as is. Mystery is the unknown quantity in the quality of life. It is what surfaces to replace wonder when the unexplainable can no longer be explained from our level of reference. We will never know all the questions, nor all the answers, though if we are curious, we may define how to raise our appreciation for learning. There are great mysteries and small minor questions that travel with us throughout life. 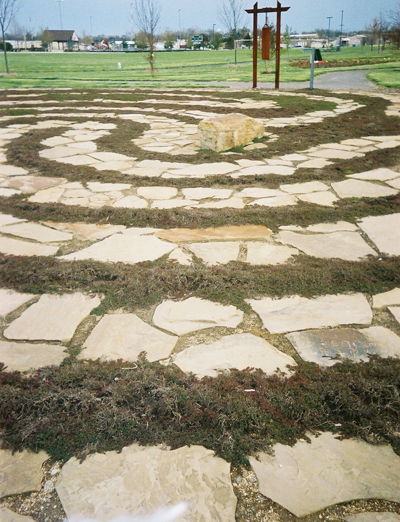 Take a few onto the labyrinth to unwind meaning, message, metaphor or even a little magical understanding. The secret to appreciating mystery is in not having to solve everything. Mystery makes us walk a little farther and explore a little more. Whether designing art, writing, developing a permanent structure, offering a program or hosting a walk of the labyrinth, the magic is in how a creation finds a beginning point, edits and meanders in the many turns and finds a place for common interest before it is reflected, tested and completes itself. The mystery is lessened in the system of approach and yet will not reveal results until it is magically realized. Walk with what is unknown to realize what needs to be known and what can remain a mystery. Tis the Ides of the month in the middle of May and a time to mark your calendars as having reached the 135th day of the year marking that we are more than a third of the way through the year at 37%. On this day we join in dialogue and celebrate what we have found significant in the first half of the month, how it has helped us to realize more of who we are and what we are capable of and how we might have appreciated our journey of discovery so far this month. The second half of our month offers a chance with realization to celebrate and appreciate in a different way, the things that come across our path, make our trails or migrations that we intentionally design. 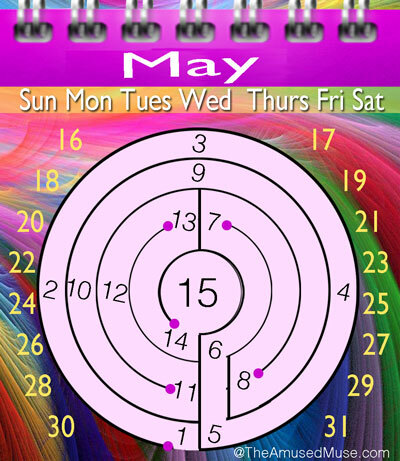 Find your significant places on the labyrinth this month, one for each celebration you have created. Rejoice, appreciate and look forward to adding markers of celebration to the second half of your month. In your walk of this day, celebrate what you have realized and appreciated in the month this far. Inspired by music today and celebrating the song of our soul. What makes us move, change attitude and appreciate our surroundings more than a tune that is timeless. Music has a way of speaking to our heart and can interrupt the path we may have been traveling that wasn’t as productive. With music we move differently, step livelier and our path has a partner that speaks to something inside that reminds us that everything is ok. This design came about in the care of my mother who loves to sing and appreciates music. In those times when she isn’t moving so well or seems to forget, turning on a little music makes all the difference. Drawing out a few notes I was reminded of the music within the labyrinth and its tonal coordinates. Beginning with one note is like beginning with one step; soon the rest seems to follow in an effortless way. This effortless is a simple example of our honest abilities being used without much consideration when we are in tuned to something we appreciate. 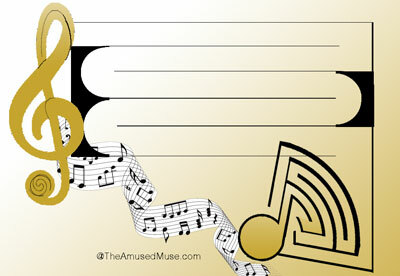 Celebrate the music in your soul steps today, what tune is playing? The labyrinth keeps me centered, and at the center, I usually complete my daily Reiki practice. Even before I began working with Reiki energy, I have been drawn to completing rituals or meditations that honor the elements and/or the kingdoms of the natural world at the center. I can feel the peaceful, accepting spirit of the space surround me as I complete those rituals. As I return to the outside world, I usually carry with me some insight about my life and the path I am meant to walk. Each new day deserves appreciation for what it is, and that my time in the spaces I hold as sacred is finite, so I intentionally bring my full focus to the time I am spending there. When I walk with others, I can see the spark of the divine in them and feel the power of our shared presence. 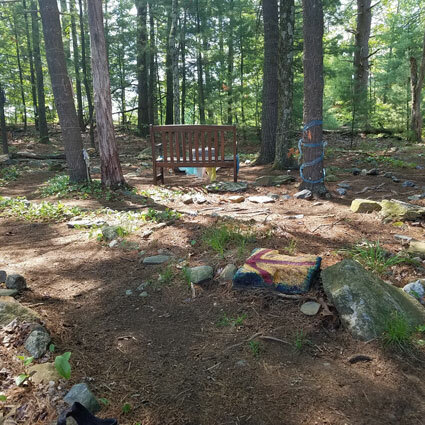 The power of shared labyrinth walks holds such potential for healing and I am glad that The Global Healing Response was instituted for this purpose. A celebration of the sacred walk. Celebrate your sacred moments within and observe what it brings out today.